We recently wrote about a huge Google update here. Basically, if your website is not mobile friendly, you are going to get punished. Well, it’s been a week since the update was released on the 21st, and I wanted to do an update on what is happening in the world of Google! The first thing to notice is that the roll-out is taking some time. This is normal. Google has said the update began on the 21st, but it could take weeks. I think it will be the middle of May before we see the full impact of what is happening, and maybe even later than that! So, what about what the actual update is, and what it is doing? Well, in the last post, we thought it would be one of two things. It now appears that Google has indeed rolled out a brand new index for mobile, just as we thought. So now when you access Google from a mobile device, you get a different index and different set of results to your desktop. This confirms that instead of having one index and just penalising non-mobile-friendly sites, you can still rank a non-friendly site on desktop just as well as before. However, you would not want to do this, as mobile is quickly becoming the most used platform. Over 50% now search using a mobile device of some sort, so you are severely limiting your customer base by not choosing to get your site sorted. The other thing we have noticed in our assessments is that the update affects individual pages and isn’t just based on the domain. So you could technically have a homepage that is mobile-friendly and ranks well, but inner pages that are not mobile-friendly, and don’t rank at all in the mobile results. 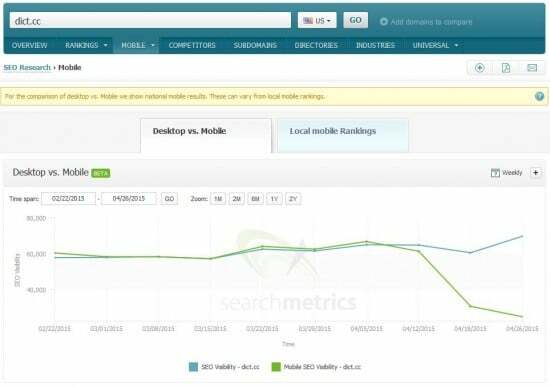 See the below graph showing how one site that isn’t mobile optimised has now lost some indexed pages in its mobile results. So, get all your top pages checked out! Now, the actual difference it has made in the search results! There is a great blog which covers this in more detail at searchmetrics.com and compares the top winners and losers. We are now seeing the results change and affect the big companies. And this does remind you of something I love about Google – they don’t care too much about status or being a big player. If you’re not mobile-friendly, you’re getting kicked anyway. No favouritism here. What the algorithm says, the results do. So here are some mobile winners so far. Look at the increase in visibility and gain. It’s huge actually. There are some huge sites in this list (Reddit, NBCSports) which have lost a lot of visibility in Google when searching on a mobile device. So the update has definitely hit! What does this mean for smaller, local businesses though? Well nothing much so far, but as the roll-out continues, expect to see some sweeping changes. If you track your rankings on a tool, then ensure the tool is tracking both desktop AND mobile results now. One good tool which does this and has already implemented a smart feature to show both is ProRankTracker. Keep an eye on your results for both – if you’re mobile-friendly, you can expect a boost over the coming weeks I would have thought, rather than a drop! The update hasn’t affected the UK and smaller business results yet, but expect it to soon. We may do another post on this to keep you all informed, but ensure you begin tracking your rankings on both indexes to ensure you can react quickly to any huge jumps.